The left colic artery is a branch of the inferior mesenteric artery that runs to the left behind the peritoneum and in front of the psoas major muscle. It supplies blood to the descending colon. Generally the left colic artery begins from the inferior mesenteric artery, move upward inside the left colic mesentery and after its beginning divides soon into an ascending and a descending branch. The ascending branch travels anterior to the left kidney, joins the middle colic artery and travels inside a fold of tissue that links the transverse colon to the abdominal wall known as the transverse mesocolon. The upper part of the descending colon and part of the transverse colon are supplied by ascending branch. The descending branch connects with the ascending branch of the sigmoid artery and move into a fold of tissue that joins the sigmoid colon to the abdominal wall called the pelvic mesocolon. The lower part of the descending colon is circulated by descending branch. Left colic artery travels sideways in the upper left colic mesentery, simply inferior to the duodenojejunal flexure to circulate the upper descending colon, and in the section of the distal transverse colon creates either part or the entire marginal artery. Left middle colic artery is an attachment that might be created by the left colic artery itself. The left colic artery creates a branch shortly after its origin, occasionally which ascends in the mesentery and joins directly with an identical descending branch of the left branch of the middle colic artery. 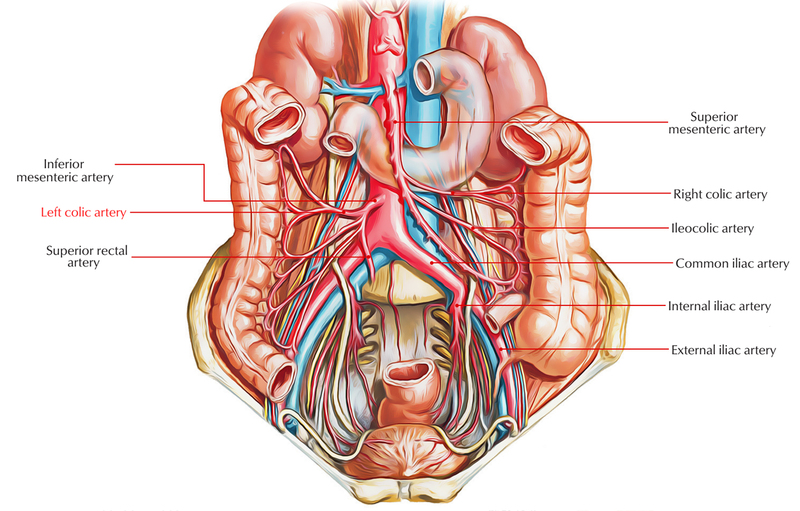 Generally, the dominant arterial supply of the splenic flexure is via the left colic artery but may be via the left branch of the middle colic artery also. Descending branch: The lower part of the descending colon. Ascending branch: The upper part of the descending colon and part of the transverse colon. The dominant arterial supply of the splenic flexure is usually from the left colic artery but may be via the left branch of the middle colic artery.